A few weeks ago I wrote a blog entry about the cupcake toppers I created for the Queen’s Diamond Jubilee celebrations. The event took place at shopping mall in Paris suburbs, so it was more of a marketing move than an actual celebration, but still, I thought it was a great idea. Last week I made a short stop at Les Passages (that’s the shopping mall) to take some pictures of the event. Emilie was in charge of the cupcake decorating classes, which were fully booked days in advance. With only a 5-minute break between groups it was more of a marathon really, so she had to hurry to clean and set everything up before the next group arrived. The best thing was that people of all ages were participating, from three-year olds to grandpas, a mix of generations gathered around the table excited about Emilie’s white chocolate frosting and the colorful sprinkles. Take a look at the pictures, I hope you’ll like them. With the highly anticipated Diamond Jubilee celebrations taking place in the UK, I was surprised to be asked to create some cupcake toppers for the occasion. No, it wasn’t Queen Elizabeth (in case you were wondering). Surprised because a) the request came from a French client and b) the client is in fact a shopping mall in Paris suburbs. Les Passages, a shopping mall in Boulogne-Billancourt is hosting the event “Garden Party: Jubilé de la Reine” from Wednesday May 30 through June 9. Several activities are scheduled but the one I’d like to talk about is, of course, the one involving cupcakes! Starbucks and Inno are sponsoring this event and Mademoiselle Cupkilleuse a.k.a. Emilie Charignon will be in charge of the cupcake decorating workshops. 8 workshops are scheduled every day, you only have to register at the stand. Personally I think it is a great idea to attract more customers and promote the shops, plus who said that only the English can have fun during the Jubilee celebrations? After all it sounds like a good excuse to have a party. 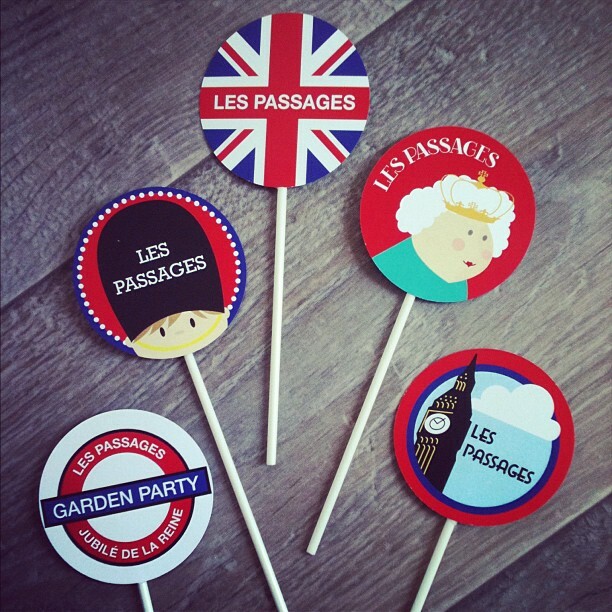 So if you are in Paris, please stop by to have a cupcake and take home one of these cute toppers. Recently I had the opportunity to work on a cute project with Emilie Charignon. For those of you who don’t know Emilie, she is a former Masterchef France contestant who is gaga about cupcakes. Her dream is to open her own pâtisserie in Paris, but in the meantime she holds cupcake decorating classes throughout the country. Emilie contacted me a few weeks ago and told me she needed some cupcake toppers to promote her client’s brand at an event. She asked if I was interested and I said yes; of course. When the details came in, I was surprised to learn that “some” cupcake toppers meant a few hundred; that her client’s brand was Rebecca Bonbon (a cute French bulldog character from the same creator as Hello Kitty); and that the “event” was in fact la Foire de Paris, only the largest trade show in France for everything home related! Once I had the logo, between creating the toppers, printing, cutting and gluing it took me about a day to finish, and hubby helped with the packing. I delivered the final product a couple days before the event and then I only had to wait and see them on the actual cupcakes. Check out the slideshow and see for yourself! Hi there, my name is Diana. I love to draw colorful, cheery characters that reflect my sense of humor. I love to laugh and I am always in a good mood, except when I’m hungry; I get cranky when I’m hungry. I have a serious addiction to Coke Zero, M&M’s and spicy food. I own a dog, or the dog owns me…not quite sure…and I live happily married in Paris, France. Come on in, stay a while, I hope you enjoy my blog.